Boukari is a traditional fishing village located on the South East Coast of Corfu, just over 3 miles from the resort of Messonghi. 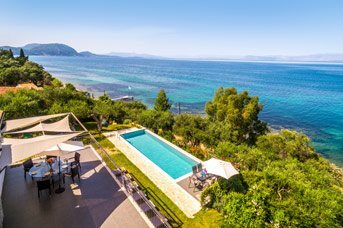 You’ll be spoilt with lush green surroundings, breathtaking sea views and several tavernas lining the waterfront of this relaxed resort. The small shingle beach has clear, shallow waters – perfect for a laid-back family holiday! It’s flanked by a vast area of olive groves, providing natural shade to visitors and locals alike. What’s not to love? There is one local mini market in Boukari to pick up daily essentials. You’ll also find a slightly greater selection in the shops located along the main road between Messonghi and Moraitika, no more than 5 minutes’ drive away. For more serious retail therapy, head to Corfu Town, around 30 minutes away by car where you’ll find a selection of boutiques and gift shops selling a huge variety of goods. Bouraki, is famous for fish tavernas and diners are encouraged to choose their own fish from the kitchen which will be cooked to their liking. In Messonghi, you’ll find a wider choice of cafes and bars as well as several lovely tavernas and restaurants to choose from. Nightlife is low key, however for livelier options head to Corfu Town. If you wish to explore the area, head to the Achileion Palace in the scenic village of Gastouri, 15 minutes away by car. It’s a photographer’s delight, surrounded by cypress trees and other exotic plants and flowers. Linia is situated 5 miles from Boukari, right next to the magnificent Lake Korission which is recognised as an area of natural beauty. It is easily viewed from the traditional village of Chlomos which is built above it. While here it’s worth sampling the local specialties from the tavernas. A trip to historic Corfu Town is not to be missed with an architectural legacy including Sicilian, Venetian, French and British. This town has kept many of its imposing buildings including elegant mansions, superb palaces, French-style flowering squares and imposing fortresses. This is just 30 minutes’ drive from Boukari. The rocky headland that is juts east from Corfu Town is topped by the Venetian-built 14th-century Old Fortress which also holds later structures from the British era. Today, concerts are held here during the summer months. 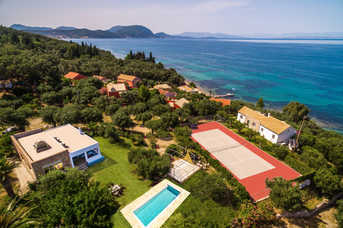 If the children tire of swimming in the crystal clear sea, or playing on Boukari Beach, Corfu Aquarium on the West Coast of Corfu is an hours’ drive away. It’s a fascinating way to explore the Mediterranean underwater sea life. 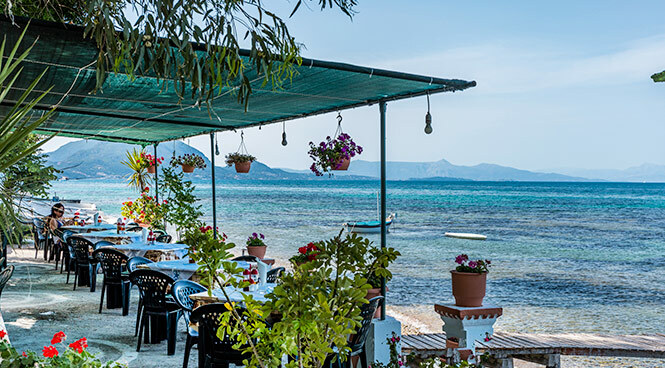 Closer to home is the Kitesurf Centre located on Halikounas Beach, around 8 miles away, which offers activities such as kitesurfing lessons, kite buggy’s, and paddle boarding. Alternatively, the Aqualand Waterpark just outside Corfu Town makes for a great day out. Boukari Beach has crystalline and shallow waters making it perfect for families. It is a relatively small beach with a cafe serving drinks and snacks. Alternatively, why not pack your own picnic? Issos, Halikounas and Messonghi beaches are also within easy reach. In Issos, the endless seashore has unique sand dunes and rich flora dividing the shore from the most important wetland of Corfu, the Korission Lake. Halikounas beach is perfect for children, with plenty of space to build sand castles and shallow waters for swimming. If you head to Messonghi, the beach offers several water sports facilities such as parasailing, banana boats, water skis, ringos, canoe and pedal boats.